I am very thankful over the past few years Little Miss has grown to *love* eating salads. A great meal and source of nutrition, it also makes for a fast & fresh, simple school lunch! This lunch box could easily be made dairy free by substituting the mozzarella cheese with dairy-free mozzarella style shreds. It's also egg-free, gluten-free, peanut-free, & treenut-free. Allergy friendly food can be colorfully delicious! Little Miss has a mixed salad of romaine and baby spinach. Topped with freshly grated carrots, mozzarella cheese shreds, and deli turkey. 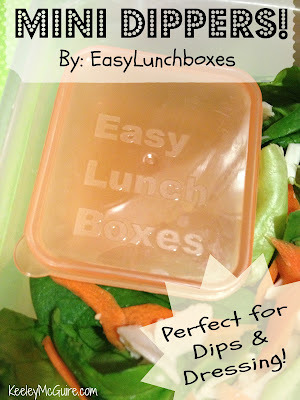 Inside her EasyLunchboxes Mini Dipper is her dressing. Again, you can pack dressing per your childs liking/ allergy requirements. She also has red seedless grapes and a chocolate chip muffin. The muffin was made with our King Arthur Flour GF Muffin Mix. The great thing about KAF's GF line of mixes is that they taste wonderful and are made in a Top 8 Allergy Free Facility! Simple use your preffered egg replacer or flax egg to keep the mix egg-free or milk and butter substitute, as well, for dairy-free. We also used Enjoy Life brand chocolate chips which are free from the Top 8 Allergens. I love your bentos! 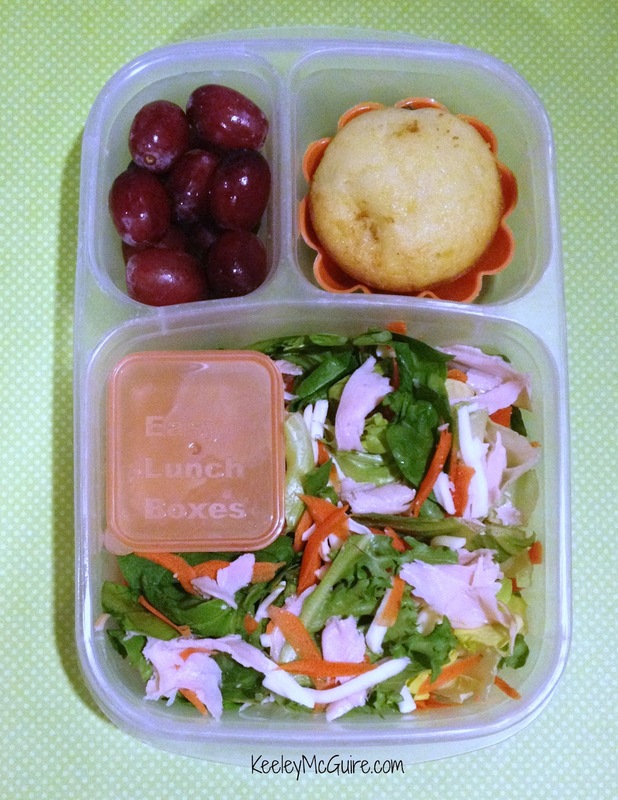 I have to pack allergy free snack bentos for my daughter because of students in her class have food allergies. Keeley!!! LOVE the special Mini Dipper photo you made for my little containers!!! I'm all about the fonts. Even more than the lunch :) Really.